After covering the sectional quarterfinals in East’s sun still shining and the semi-finals in A coach who cares. And wondering if East won., it was disappointing to miss the finals in Batavia. At about 10:30p.m. the D & C reported that East had lost. The score wasn’t close, 14 – 0, but I know Coach Kyle Crandall was proud of his Eagles even in defeat. In the article, Crandall said his players have tremendous heart. I can imagine him congratulating the team on a great season, saying they had represented East and city baseball well. And now, make me even prouder when you graduate. 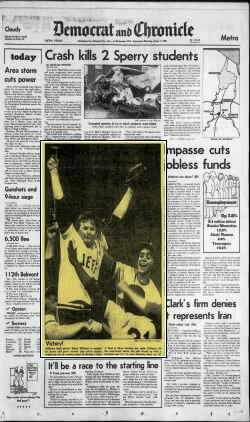 So the 1980 Jefferson Statesmen are still the last city baseball team to win the sectionals. And looking back, what a magical season it also was. In 1980 — having won the Class A sectional title the year before — Jefferson was coached by the legendary James BeDell Sr. (1929 – 2008). Elected to the Frontier Field Walk of Fame in 2000, Jim was a coach at Jefferson for 35 years; his baseball teams won three Section V titles, and his soccer, cross county and basketball teams won many city championships. He was also a pioneer in the development of physical education education programs for severely challenged students. After Jefferson, from 1989 – 1996, BeDell was the varsity coach at SUNY Brockport, his alma mater. His son Jim BeDell Jr. was a referee in the 2015 Super Bowl. 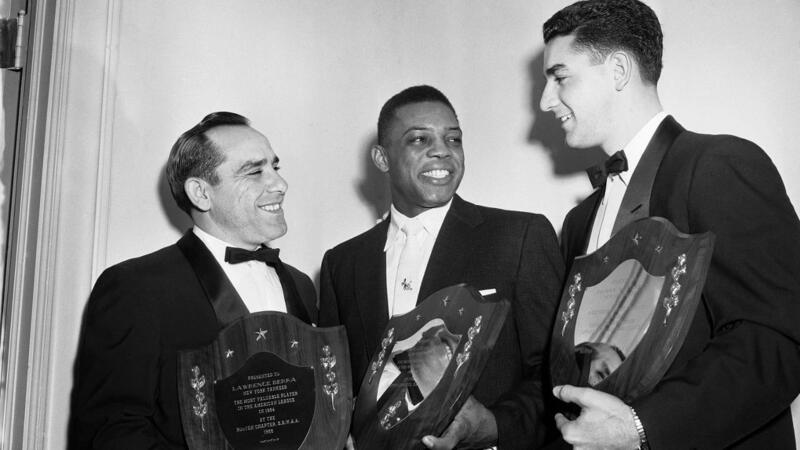 Jefferson High School grad Johnny Antonelli (right) with Yogi Berra and Willie Mays receiving awards after the 1954 season. 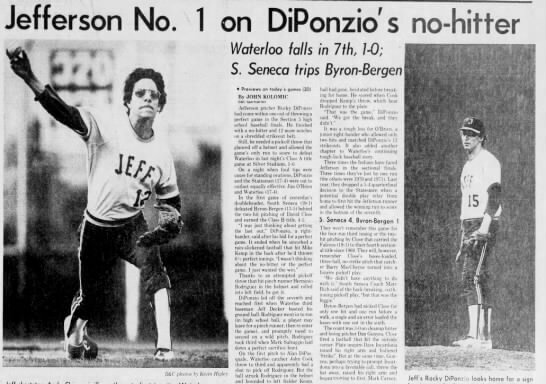 Jefferson’s star pitcher — and strong hitter — was Rocky DiPonzio. 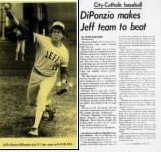 In 1979, DiPonzio had led the Statesmen to the title with a 9 -1 pitching record. By all accounts, Rocky was Jefferson’s best player since Johnny Antonelli, winner of 21 games for the New York Giants in 1954. DiPonzio was like today’s SOTA’s Kenny “Cruz Control” Cruz who we’ve reported on for several years (and nicknamed) and will be reporting on his status in the upcoming MLB draft. Rocky’s senior year opened with great expectations — ones met. The sectional quarterfinal featured an epic pitching matchup, pitting DiPonzio against Bath’s Bob Buckley. Both pitchers combined for 42 strikeouts as Jefferson eked out a 12 inning 2-1 victory with Rocky going the distance (in an era when starting pitchers often pitched complete games, in this case five extra innings). Played under light rain at Silver Stadium, the title game against Waterloo was another classic. The game was scoreless entering the 7th inning as DiPonzio was pitching a perfect game. In the top of the 7th, DiPonzio reached first with a single, and removed for a pinch runner (back then players could reenter a game after been pinch run for). An errant pick off throw allowed the Jefferson runner to score. With one out to go for the perfect game, Rocky hit the Waterloo batter. But he retired the next man for a no hitter. Jefferson had repeated as champions. While we know where Johnny Antonelli has been, internet searches find few traces of what became of Rocky DiPonzio. He did attend Ithaca College where he pitched solidly. But after 1984, the trail ends. In a 2008 Section V Talks Back thread, OldSchool78 ranked Rocky in the top 6 of Section V pitchers, along with Antonelli, Tim Redding. Bob Sekell, Mike Jones, and Tom Paws. So I don’t know if Rocky pursued professional baseball. 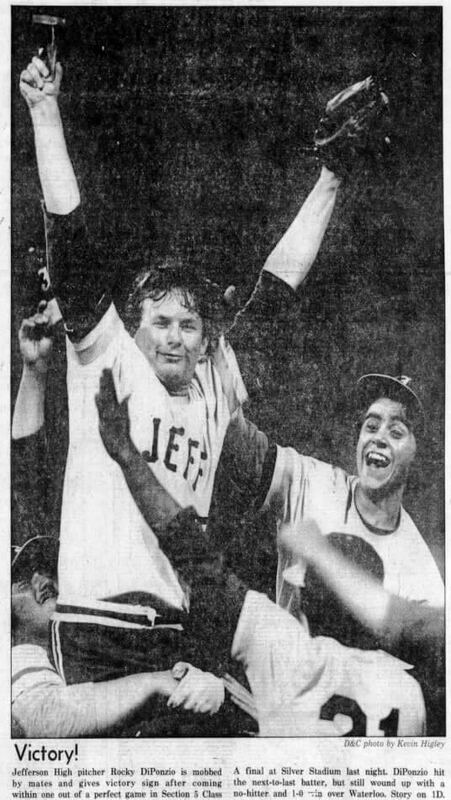 Maybe 1980 — and that no-hitter under a light rain at Silver Stadium — remains his That Championship Season. Looking back, it is not really so shocking that no city baseball team has won the sectionals since 1980. In the articles I read, dynastic city teams from the 70s where frequently referenced. from The Roberto Clemente Men’s Hispanic Softball League is back! But school district demographics were changing. In 1979 and 1980, many of Jefferson’s players had Italian last names. By the 80s and beyond, city boys were increasingly drawn to basketball and football, and it became increasingly harder to compete in baseball with better resourced suburban schools . But sports has a way of moving in cycles. I think city baseball is on the upswing. Baseball has a rich and deep tradition in the Hispanic community. Most of the East players come from within that community. And East’s success can only increase baseball participation from all communities. It won’t be another 36 years until a city team wins the sectionals. I also learned that 1980 was the first year the RSCD required a C average for athletic eligibility. As columnist Greg Boeck said; “Why all the flap?” Boeck’s comment holds true today. While the issue still comes up for debate — and there are reasonable exceptions — linking academic effort and performance with the privilege to play sports is a good thing. As seen in Boeck’s column, Coach Debell agreed, writing a letter to the D & C in favor of academic standards. While I’ve never specifically asked East’s Coach Crandall, I bet he would agree too. And probably tell you 81% of East players who have worn varsity uniforms have graduated. Also see Meghan McDermott’s look back at the cultural context of 1980 in What the East High baseball team and Jimmy Carter have common. The Roberto Clemente Men’s Hispanic Softball League is back! Another bad call at the Rochester Airport. Triad replaced by "Business Center."